The citywide spring clean-up is just around the corner. Here are a couple of tips for when you are transporting debris to the dump or hauling anything in general, from Captain Randy W. Tyner with the Ponca City Police Department. 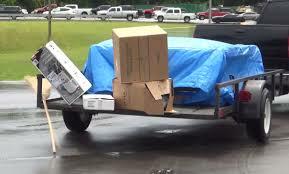 Make sure to secure the load you are hauling with straps or rope, so it does not come out of the truck or trailer. Also make sure to cover the load with a tarp if you are hauling material that can blow out of the truck or trailer, Tyner said. When a load is lost and spills onto the road, several things can happen, Tyner said. Other motorists can run over the load and damage their vehicles. It can cause other motorists to have accidents that could result in injuries or a fatality. The road could sustain damage and need to be repaired. Debris in the roadway also puts officers in harm’s way when they have to clear the debris from the road. Failure to secure your load is against the law. According to the Oklahoma Highway Safety Office Database, in 2017 there were 43 accidents with injury in Oklahoma that were caused as a result of an unsecured load.